What is Princess® Skincare Green Tea Face Mask? The Princess Skincare Green Tea Face Mask is perfect for use on dry, tired, and stressed skin—especially following an aesthetic treatment. With the power of green tea and aloe, this mask calms and soothes skin while also promoting repair and offering antioxidant protection. It is suitable for at-home use, making it an easy fix for patients with irritated skin. 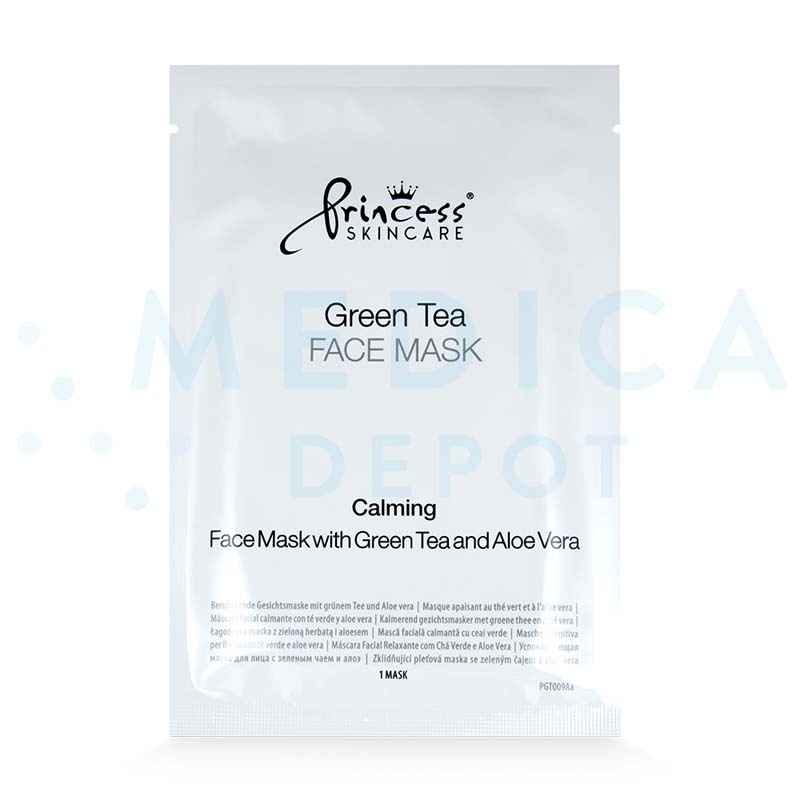 Princess Skincare Green Tea Face Masks may be ordered online from MedicaDepot.com. Alternatively, you can phone our friendly customer service associates to order this and other medical supplies. 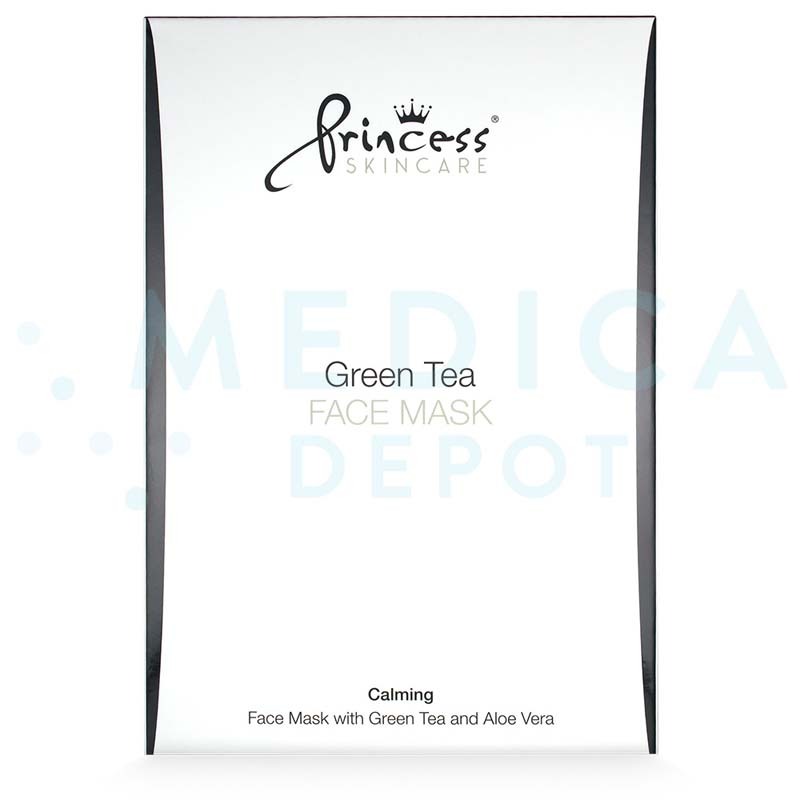 When you order Princess Skincare Green Tea Face Masks from Medica Depot, you can help your patients soothe, hydrate and protect their tired and irritated skin for a softer complexion. Each box contains 8 individually-packaged masks and 1 packaging insert. Plastic surgeons and dermatologists may recommend Princess Skincare Green Tea Face Mask to their patients with dry, tired, and stressed skin. This irritation may stem from environmental exposure or side effects from aesthetic treatments. Dermatologically tested and paraben-free, Princess Skincare Green Tea Face Masks are suitable for all skin types. The Princess Skincare Green Tea Face Mask contains aloe vera leaf juice, green tea extract, algae extract, and other natural ingredients. Together, they infuse vitamins into the skin for nourishment, healing, and reparation, while also promoting the regeneration of weakened skin. Aloe is known for its soothing and healing properties, working to calm irritated skin and promote healing and repair. Moreover, the antioxidant properties of green tea protect against free radicals, which may cause damage to skin cells and tissues. By trapping these oxidizing particles, the mask prevents skin damage—before any harm can be done. Scientific evidence also suggests the polyphenols in green tea may have anti-inflammatory and antibacterial properties, offering additional soothing and protecting qualities. When combined with the other ingredients, these substances help to soothe and hydrate the dermis while supporting skin repair. This leaves the face feeling soft, hydrated, soothed, and fresh. 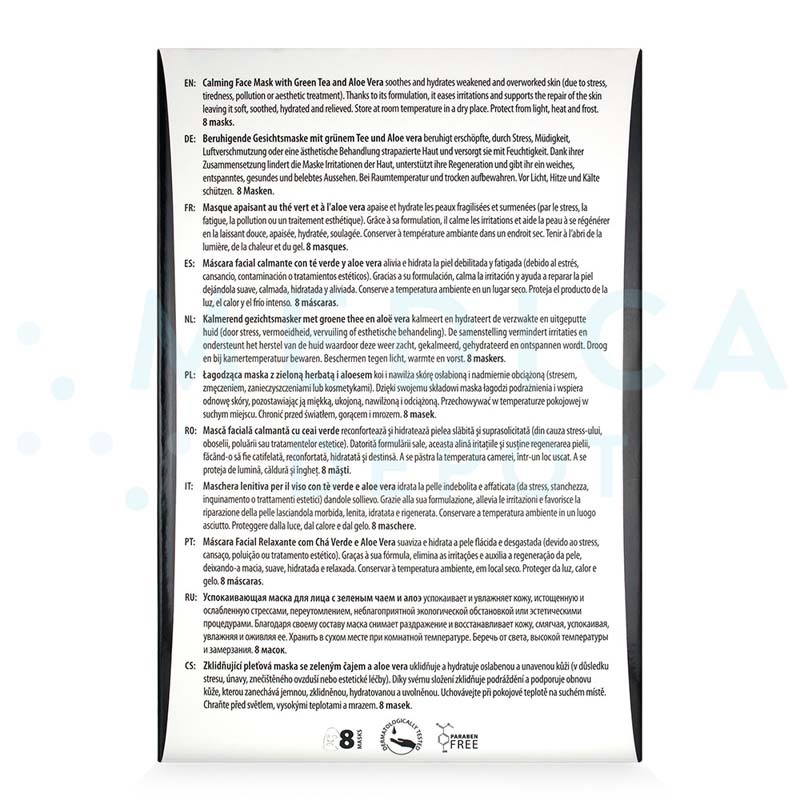 These unique masks include demineralized water, xanthan gum, carbomer, Aloe barbadensis leaf juice, pentylene glycol, Cucumis sativus extract, algae extract, hydroxyethyl urea, Morus alba root extract, saccharide isomerate, Camellia sinensis leaf extract, phenoxyethanol, ethylhexylglycerin, fermented rice bran, PEG-40 hydrogenated castor oil, chlorphenesin, perfume, and methylisothiazolinone. Your patients can use the Princess Skincare Green Tea Face Mask whenever they wish to refresh their skin. Before application, your patients should first cleanse their skin. They should then remove a mask from its packaging and align it with eye holes up, applying the mask to their face from the chin upward. Your patients should leave the mask on their skin for fifteen minutes before removal. Any essence left behind should be massaged into the skin. This product may be used to bring relief to irritated, red skin, such as that encountered after an aesthetic treatment. This skincare product is also suitable for regular use as part of a skincare routine. 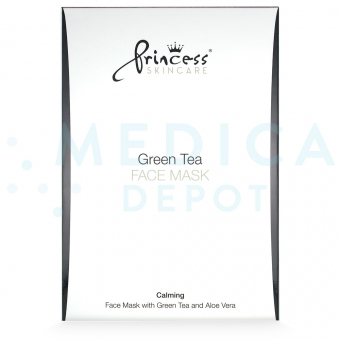 Princess Skincare Green Tea Face Masks are designed to be applied on the face. With regular use, patients can expect the condition of their irritated, red skin to improve and to be soothed. These effects will last for as long as Princess Skincare Green Tea Face Masks are used. 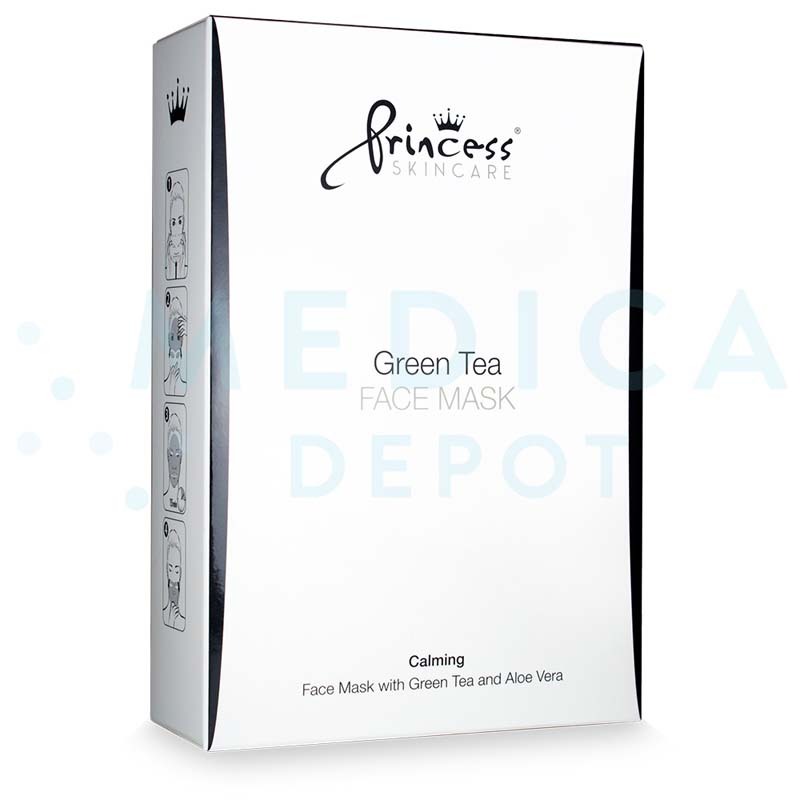 Princess Skincare Green Tea Face Masks bring about the most benefits to patients with irritated, red skin—especially those that have undergone an aesthetic treatment. This product is also beneficial to patients with generally dry and damaged skin. Princess Skincare Green Tea Face Mask is the perfect solution to ease and repair inflamed, red skin. Treatment is quick and easy, and can be done at home. Possible side effects of the Princess Skincare Green Tea Face Mask can include symptoms of skin irritation, including itching, rashes, or redness. Discontinue use if these reactions occur. That being said, this facial mask is paraben-free and dermatologically tested to reduce the chances of irritation.